Not all the great works in Niagara Falls USA are made by nature. Discover these public wall murals throughout the region. Completed in October 2016, Art Alley NF is a public mural project, located just minutes from Niagara Falls State Park. This innovative space combines a pedestrian walkway to public parking and 19 murals sponsored by local businesses and organizations. Bring your selfie A-game, or your entire wedding party for an added splash of color and positivity to your special day. Set high atop the Niagara River Gorge, this New York State park features all things art from live outdoor concerts to interactive installations. Executed by Chuck Tingley and dubbed "The Ascent," this outdoor mural was crafted with acrylic and spray paint. Located in the Lower Park, nearest the Art Gallery and Box Office. While you're there, be sure not to miss the re-installation of "Niagara 1979" by Gene Davis, located in parking lot C, adjacent to the Mainstage Theater. Supported by over 145 community backers to re-install the painting, this painted parking lot piece is made up of 60, two-foot wide by 364-foot long lines rolled in nine different colors. More than 20 years ago, 3D-artist Erie Grohe painted "Niagara" on the side of Fashion Outlets of Niagara Falls USA. Possibly one of the first mural walls in Niagara Falls, the image showcases a sweeping view of the iconic Niagara Falls and stretches 141 feet by 28 feet. The scene also features painted architectural elements common elsewhere on the existing building façade, along with actual visitors to the Falls. 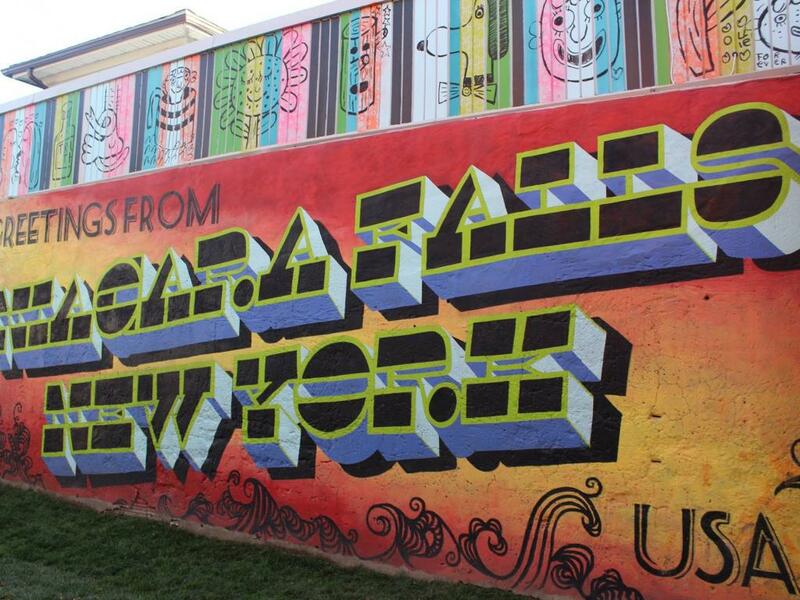 Enter the Fashion at the Falls Mural Contest on Facebook for your chance to win a $50 VISA gift card. Painted by muralist Augustina Droze, the "Mural on Main" combines images of Lockport's past, present, and future. This 42-foot icon features the iconic Flight of Five Locks, central figures dressed in period clothing, and numerous inventions dreamed up in Lockport including the fire hydrant. The mural also showcases agricultural elements depicting the Niagara Wine Trail, USA, and the historic Erie Canal.